Almost ten years after their first release in 2008, the Mount & Blade games still offer something unique in gaming: large-scale medieval battles in which you are both a participant and a commander, nestled within a strategy sandbox. 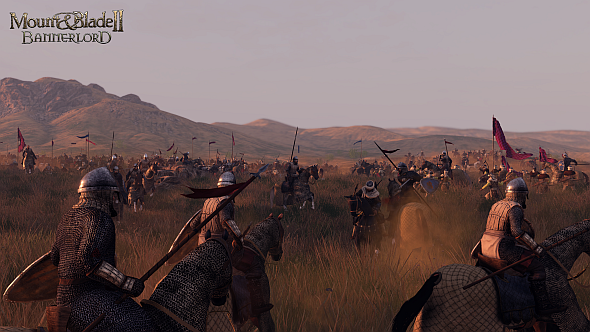 Though refined with 2010’s Mount & Blade: Warband, developers Taleworlds concede there’s a certain lack of polish in the series so far. Here’s everything we know about Mount & Blade: Bannerlord 2 so far. That said, battles are the focus of the demo I’m about to play. 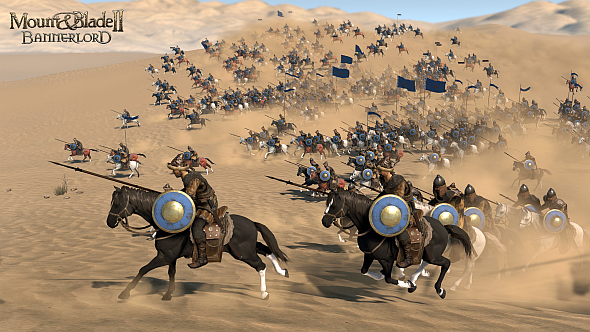 Taleworlds reckon they can fit up to 600 soldiers on the field at once now, and possibly more if they can further optimise the game ahead of release. You’ll still fight directly and command troops, but a new wrinkle is that you, too, have a boss, who will give you orders to follow – screen our archers from their cavalry, charge their flanks, that sort of thing. You can ignore them, but there may be repercussions on the strategic map if you do. There’s even AI dedicated to controlling what individual soldiers are doing, from their behaviour when skirmishing to which attack they’ll choose next. The implications of this weren’t apparent in the battles I fought, but Taleworlds say it’ll mean a lot more depth, and perhaps a few “dramatic moments” that will catch you by surprise, and have profound implications on the strategy layer. I had the chance to play a couple of battles, and to speak with Korneel Guns, gameplay programmer at developers TaleWorlds Entertainment, about how they’ve evolved since Warband. In fact, that’s where we began. 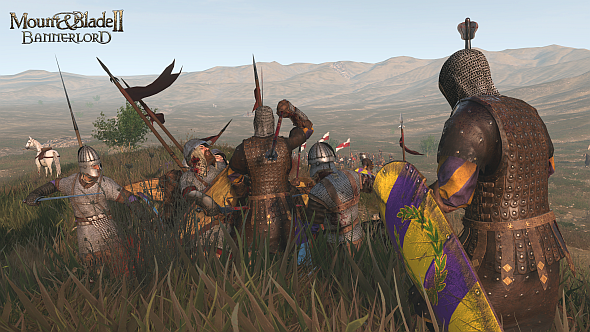 PCGamesN: So, how has the game progressed since Warband? 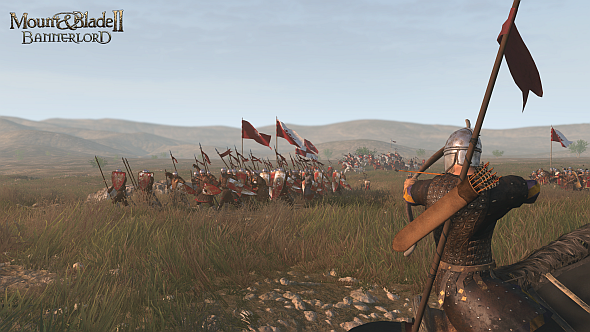 Korneel Guns: It’s completely Mount & Blade at the core. We didn’t only take the original and expand it; we took what was in Mount & Blade, went through every single feature, and just made everything better. The combat is more refined, the politics, the intrigue, the trading – when you get a request to kill some bandits, that’s not a random request. It’s much more dynamic. Trade happens when traders are looking for a profit, and fights happen because different parties are trying to gain land and trying to make themselves more powerful, not just their faction. All these things happen for real reasons now. Let’s dig into all of that, starting with the combat. We hear that, due to individual physics, a tactic that worked in real life would work in the game, not because it’s been specifically coded but because it just emerges. How does that work? We do lots of physical calculations for many things, not just the combat. But if someone is trying to hit you and someone else is standing in the way, then he might get hit by the strike that was meant for you. And for cavalry riding across the fields, everything they hit can just get bumped away, so it matters how fast they’re going, it matters how heavy the horses are – if you have heavy cavalry charging downhill, that’s an unstoppable force. They might try to stop you with their infantry, but at the bottom of the hill, [the cavalry] will just crush them and keep going. If you are going uphill, it’s a completely different story. They can stop you, and you are stuck, and they may just kill you. So it’s not ‘I have cavalry, they have infantry. I charge them, they die’. You have to use them correctly. And how deep does this go? Does it extend to weaponry, too? All of our weapons have statistics. We have balance, we have how sharp they are, so it matters if you slash or pierce. We also have how heavy they are. All those things give different results, and it depends on what armour you have. We don’t have anything as in-depth as chain or plate, just have heavy armour or light armour, but it definitely makes a difference. How much of this is new compared to earlier games? The first one had similar things like armour value, which is localised to chest, legs, or arms. What’s new is that it’s more physically calculated. It’s not just ‘swing and return damage’. What matters is that the sword is this heavy, this sharp, it does this much damage. But, if you hit someone too soon, it won’t do its full potential of damage. If he’s standing just too far away and you get him with the tip of your weapon, it also doesn’t do much damage. You want to hit him with your entire blade at the [right moment]. Have their been any changes to the morale system? It’s not just a formation that can break morale. [Soldiers] can individually break. So, if they are holding formation, and you charge them from behind, that’s going to give them a big shock. They will try to fight a bit first, and then they see that it’s just overwhelming, so they can rout while the rest of your army is still fighting. It’s very individual. And how about the setting – we’re still in the continent of Calradia, yes? Yes. It’s the same continent, but it’s set before Warband. It’s also, I believe, four times bigger than what it was in Warband. We also have more mountain ranges, and more rivers going through. It’s the same setting in the lore, but players will find a lot more detail. Is there a reputation system or relationship system in the politics side of things? You have the relationship that you have with your own faction. Everyone in their factions is trying to make their faction more powerful, so you have a relationship with your team. But you’re not just trying to make your faction more powerful. You’re also trying to make yourself more powerful. You’re a selfish person – you want more lands, you want more armies, you want more gold. So you have a relationship with the Lords. You have relationships with NPCs which you can use to get more recruits, for example. If you have a better relationship with the NPCs, you get more troops for a better price and you can build an army faster. You also have relationships with Lords from other factions as well. You can be at war with a faction and be on good terms with a Lord within that faction, so it’s a lot more grey and nuanced. Is there a narrative element to it, or is it still a sandbox? It is mostly sandbox. There’s a bit of narrative at the start, just a tutorial to get you on your feet first. Then it will take more and more of a back seat, because at the core, Mount & Blade is a sandbox. We want people to make their own path and their own narrative. 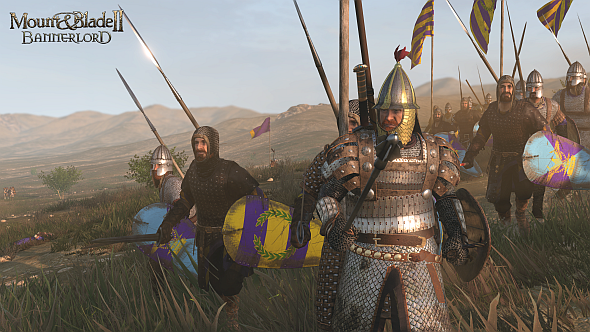 An exact release date for Mount & Blade II hasn’t been given – which is starting to ruffle feathers among the community – but at E3, Taleworlds repeated their ambitions to launch this year. You can learn more on its Steam page, or pick up Warband here.